The year 2017 was a year which could be seen as the year of American aircraft. The United States was visited for the first time at the beginning of 2017. The visit to this country was immediately the highlight of the year. The RIAT at RAF Fairford was also dominated by the USAF, because the United States Air Force celebrated its 70th anniversary. Furthermore, the NATO Tiger Meet was visited in France in June. The most exciting event in 2017 was the visit of the US Army's 10th Combat Aviation Brigade to Eindhoven Air Base. At Volkel, a total of 15 F-16s left to Jordan after they were sold. 2017 was an very succesfull year due to the large amount of exercises. The EC135s of the ANWB are daily deployed in the Netherlands as flying ambulances. These bright yellow helicopters are known in the world of aviation as the Lifeliners and are also known as the trauma helicopter. The helicopters are used in case of emergency of the highest category when road transport by ambulance is not possible. The Elizabeth Hospital in Tilburg is one of eleven trauma locations in the Netherlands where these helicopters are able to drop off victims of accidents. The helicopter will land on the helipad next to the hospital. For years, Luke Air Force Base near Phoenix in Arizona was the main training base for the F-16 Fighting Falcon pilots within the United States Air Force. Besides the introduction of the F-35A Lightning II at this airbase, there are still a number of important training units stationed which train pilots on the F-16C/D. The training consists of both theory lessons in the classroom and also flying training missions. The students will fly basic maneuvers and later the tactical aspects. The pilots are fully qualified on the F-16 after their training. Since the F-35A Lightning II has entered service at Luke Air Force Base, this airbase has become the most important training base on this type within the United States Air Force. Most American pilots who will be converted from the F-16 Fighting Falcon to the F-35 Lightning II will undergo this training at this airbase. Luke will also become the main training airfield for the F-35A pilots for a number of important partners such as Norway, Japan and Turkey. The USAF has more than 150 F-35As which are mainly based on Luke AFB and Hill AFB. The American Air National Guard's largest F-16 training facility is based on Tucson International Airport. F-16 pilots and ground staff of the United States Air Force from all over the world are trained in flying and maintaining the Lockheed martin F-16 Fighting Falcon. The 162nd Fighter Wing is also actively part of the AZ ANG. The Arizona Air National Guard (AZ ANG) is the air force militia of the US state of Arizona. Next to the Arizona Army National Guard, the AZ ANG is part of the Arizona National Guard with the main task to defend the state. The 162nd Fighter Wing at Tucson International Airport consists of four F-16 squadrons. All units and aircraft at this air base are identified by the tail band with the flag of the state of Arizona. Three out of four of the F-16 units carry the tail code AZ. The fourth unit is an special operational testing unit and carries the code AT. The Air National Guard Air Force Reserve Command Test Center (AATC) is the fourth unit of the Air National Guard at Tucson International. The AATC is a testing unit performing tests and evaluations for the ANG and AFRC. The Red Flag exercise is an advanced air defense exercise which is currently organized on Nellis Air Force Base in the American State of Nevada. During these two-week exercises, all possible modern war scenarios will be discussed and trained. The modern fighter pilot is educated here during its career. With the Red Flag exercise are air crews from the United States Air Force (USAF), the United States Navy (USN), the United States Marine Corps (USMC), the United States Army (US Army) and many other NATO members been trained. The 414th Combat Training Squadron (414th CTS) is an American Air Force unit which is assigned to the 57th Wing at Nellis Air Force Base in the American state of Nevada. The 414th CTS is an important non-flying organization that is specialized in offering the famous Red Flag exercises to train modern combat pilots. The 414th CTS has no aircraft in use anymore since 2005 and is therefore only facilitating the Red Flag exercises. Nowadays, the unit organizes the Red Flag exercise on Nellis Air Force Base more than five times a year. The 64th Aggressor Squadron is a unit which is based at Nellis Air Force Base and is specialized in imitating and emulating enemy aircraft during exercises like Red Flag. The unit is currently equipped with the Lockheed Martin F-16C Fighting Falcon. The aircraft of this unit can be recognized by the various exotic color schemes. In total, the 64th AGRS has 24 F-16 Fighting Falcons available for use during the exercises. The 64th AGRS plays nowadays an important role in the training of the fighter pilots and is involved in many exercises. At the largest American air base Nellis Air Force Base at Las Vegas in Nevada, the exercise Red Flag 17-2 took place from Monday February 27 until Friday March 10, 2017. During this two-week very intensive exercise the emphasis for the participants was mainly on the air defense role during the majority of the missions. Red Flag is the most realistic air combat exercise in the world. During this two-week exercise, the Red Flag 17-2 participants will record it as "Blue Air" against the "Red Air" aggressors in a massive air combat scenario. The Jedi Transition in Death Valley is an area where it is possible to photograph military fighters up close in the low flying route. The Jedi Transition is a low flying route in the Rainbow Canyon which is also known as the Star Wars Canyon. This canyon owes its name to the famous Star Wars movies which were filmed here. Low level flying is a way of flying which is very intensive for military fighter pilots and it has the element of surprise. It requires a high degree of concentration due to the extreme high speed close to the ground and the mountains. To have a successful photoshoot in Death Valley, it is important that a few necessary preparations will be made upon front to this visit. The Star Wars Canyon in Death Valley is one of the most remote and inhospitable areas in the world and should be taken very seriously, because it is especially extremely hot. Death Valley is known as one of the hottest and driest places on Earth. In the summer the temperature here can easily reach towards 50 degrees Celsius and it is an extremely dry combustion which people do not notice right away. One of the airports which is located around the American city of Phoenix is Mesa Williams Gateway. This airfield is a small civilian airport where usually business jets of civilian companies are stationed. Regularly, also military aircraft will spend the weekend at this airport. The aircraft will typically come in on Friday and will depart again on Sunday in the afternoon. There is at Mesa Gateway a platform reserved for this weekend charts which are using this airport. Most aircraft which can be found here are from the Navy and the Marines. In the period from March 27th until April 7th, 2017, the exercise Frisian Flag 2017 was held at Leeuwarden Air Base. During this exercise tactical scenarios were practiced in a multi-national cooperation. The worldwide strategic prospects that lie at the basis of the exercise have changed dramatically in recent decades. The exercise Frisian Flag annually attracts participants from several countries to Leeuwarden Air Base to train together for a two-week period in a unique training environment and has an an enormous size of more than 60 aircraft. Frisian Flag is an exercise with a large field of participants. To coordinate an exercise of this scale a structured approach has been established. In a two-week period of time more than 60 aircraft will be active on a daily base in a relatively small practice area which is generally located above the North Sea. The host of the exercise is the Dutch no 322 Squadron which is stationed at Leeuwarden Air Base. The entire area where the exercise will take place has a size of more than 210 km by 320 km wide between the Netherlands and Denmark. The European Air Refueling Training 2017 is held at Eindhoven Air Base in parallel to the exercise Frisian Flag at Leeuwarden Air Base. During the training, both the fighter pilots from Leeuwarden and the crews of the tankers from Eindhoven are trained in the air to air refueling process and its associated procedures. This year is the fourth time that the EART training is organized by the European Air Transport Command (EATC), which is also based in Eindhoven. The EATC is a multinational transport command and has seven members. 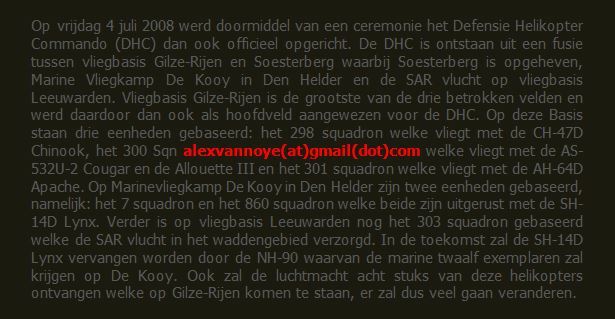 For the first time since years, the Belgian Air Force organized the Helidays again. Where in the past these days took place on Bierset, the event took this time place on Beauvechain. There were also be a several foreign participants in Beauvechain during this small airshow which was organized by the 1 Wing. On Tuesday, April 11th, a Spotters Day would take place at Beauvechain during the arrival of the helicopters for the Helidays. In total, more than 500 tickets were available for photographers and they could enter the base from noon. In the period from May 5 until May 15, 2017, there would be no less than seven Austrian EF2000 Eurofighters present on the German air base Wittmund in the north of the country. Wittmund is home to the Taktisches Luftwaffengeschwader 71 (TLG-71) (Richhofen), which is also equipped with the EF2000 Eurofighter. The Austrian fighter planes are all stationed at Zeltweg Air Base. The Austrian Air Force has been flying the EF2000 Eurofighter since 2009. The Eurofighter is the successor to the Saab J35o Draken, which was retired in 2005. Discovery Air Defence Services is a Canadian company specializing in providing military air combat training. The company provides different training services for military aviation and is mainly active in Canada and since 2015 in Germany. Discovery Air is using some types of military fighter aircraft for these training sessions. Discovery Air Defence, which was formerly known as Top Aces, was founded in 2000 by three former CF-188 pilots. Originally, the company's focus was on offering aviation advisory to the DND department in Canada. Every year, the NATO Tiger Meet is one of the exercises in Europe that is widely visited by plane spotters from all over the world. During this traditional exercise, a spotter day is usually organized by the NATO Tiger Association. All kinds of aircraft are painted in tiger schemes and will appear in front of the aircraft spotters. The NATO Tiger Meet 2017 would be organized by the French Navy and especially by the 11 Flottille. This unit of the French navy is based at Naval Air Base Landivisiau in the western tip of Brittany in France. The Dassault Rafale is the most modern fighter plane of the French Air Force and Navy. The name Rafale literally means "gust of wind" in the French language. The Rafale is a double-engine fighter aircraft with a canard delta wing configuration. The Rafale is built to be multi-role deployable and is able to land on a ship. The Rafale derives from a European Program (Future European Fighter Aircraft, FEFA) from the 70s where several countries together wanted to develop a European fighter. France broke out of this program and developed the Rafale. The only user in the world of the French Dassault Rafale M is the l'Aéronautique Navale Française (French Navy Aviation Service). In total, three operational Rafale M squadrons are active within the French Navy. The three Rafale M units operate all three from the French nuclear driven aircraft carrier Charles de Gaulle. The Rafale M units in France are the 11, 12 and 17 Flottille and all three are based on BAN Landivisiau in western Brittany. There is one other Rafale conversion squadron which is assigned to the AdlA (French Air Force). The Belgian no 1 Squadron is the oldest squadron of the Belgian Air Force. The history of the unit began during the First World War, when the squadron was established as an air defense squadron of the Belgian Army. Today the no 1 Squadron is equipped with the F-16 Fighting Falcon and is stationed at Florennes. The badge of the no 1 Squadron is recognizable by the green and blue thistle. This plant is shown in a golden crown on a black background. The unit is nicknamed "Stingers" and corresponds to the thistle on the badge. In the period from June 5 until June 16 2017, the Tactical Weapons Meet 2017 took place at the Belgian air base Florennes. This exercise was organized by the Belgian no 1 Squadron. During the exercise also a spotter day was organized. The spotters were able to photograph the participants of the exercise during this day. The spotter day was organized around the exercise to celebrate the 100th anniversary of the no 1 Squadron. For this occasion an F-16 of the squadron was painted in the black and yellow colors of the no 1 Squadron. This year the NATO E-3 Component is celebrating its 35 anniversary. To celebrate this, a small open house was held at Geilenkirchen Air Base. Geilenkirchen is the most important airbase of the E-3 Component. The E-3 Sentry fleet of NATO has been responsible for the safety of European airspace for more than 35 years. The NATO Airborne Early Warning & Control Force (NAEW&CF) was established in January 1980. The headquarters of this NAEW&CF was established in Geilenkirchen in Germany and was operational at the end of 1988. Since the introduction of the E-3A Component within the NATO, the role of the Sentry can no longer be ignored in the context of the European security. This role became more important than ever since the fall of the Berlin Wall. The roles which the crew of the Sentry fulfill are all crucial during a surveillance mission. The crew of the E-3A Sentry is quit diverse. The crew working on a standard AWACS (Airborne Warning And Control System) consists of 16 persons. Everyone on board has its own specific roles during a mission. The Royal Danish Air Force (Flyvevåbnet) is part of the Danish defense and has been a separate unit within the Danish armed forces since the beginning of the 50s. The Danish Air Force has for years been responsible for the security and monitoring of the Danish airspace against unwanted intruders and possible aggressors. Four aircraft are always ready for this task on Quick Reaction Alert (QRA). The QRA is a very high state of readiness, using the Danish F-16s to protect the airspace of Denmark and the other NATO countries. Denmark is a country which also participates outside its own borders in detachments when it comes to Quick Reaction Alert. One of the most important missions in which Denmark has participated in the QRA task were the "Air Policing Missions" over the Baltic States and Iceland for the security of Europe against Russia. The last missions around the "Air Policing" in which Denmark was involved was an experiment in Greenland. The defense of Greenland and its airspace is the responsibility of Denmark with its F-16 Fighting Falcons. Before 1947, the responsibility for military aviation was divided between the United States Army, the Navy and the United States Marine Corps. The Army was the first to create a variant of the Air Force at the Aeronautical Division, Signal Corps on August 1, 1907, when worldwide aviation was still in its childhood. The Air Force of the United States became on September 18, 1947, for the first time in history a separate military service with the implementation of the National Security Act of 1947. The new air force was called the USAF. After the Second World War, much would change within the United States air forces. Major organizational changes would occur in the entire organization. The United States Air Force would also enter the jet age in a short period of time. Technically, aviation made a huge step forward in the post Second World War years. After the Second World War, relations between the United States and the Soviet Union began to deteriorate and the period in history known as the Cold War began. The United States started an arms race with the Soviet Union. After the Vietnam War, a new era would dawn for the United States Air Force. The Air Force had learned wise lessons during this bloody war. The whole philosophy of how an air force should function was drastically changed. The knowledge of air battles and attacks on ground targets had slipped to a maximum depth. The USAF moder- nized its tactical air forces at the end of the 1970s with the introduction of the F-15, A-10 and F-16 fighter jets, and the implementation of realistic training scenarios such as Red Flag on Nellis AFB. Today, the United States Air Force is the largest strongest and most modern air force in the world. Just like American politics, the Air Force plays also an important role during the majority of the conflicts and crises in the world. The USAF is to execute this effectively an well-organized branch of the American defense. The USAF is a large body within the US Department of Defense. In total, the USAF has eight organization layers that ensure that all aircraft and ground staff are used effectively during any mission at any place in the world. This year the Oirschotse Heide was again visited a number of times. Usually this location provides spectacular photos of the Dutch helicopters of the DHC. In February, a single Chinook from Gilze-Rijen came in front of the lens during several practice landings. During this period it was quiet on the heath due to a number of other major exercises. The best photos were taken in August when the heath was in full bloom. An Apache was intensively training at that moment and it used the present photographers as targets for his exercise. This year, the 73th anniversary of the famous Operation Market Garden was commemorated. Traditionally, the commemorations are always accompanied by the necessary parachute droppings of different airborne troops of the army. These airborne troops are from several countries during the annually commemoration. From September 11 until 16, 2017, the parachuting exercise Falcon Leap took place for the third time. The special during this edition was the 25th anniversary of the 11 Airmobile Brigade of the Dutch Army. The Brilliant Arrow 2017 exercise (BRAW17) is the biggest exercise of the German Luftwaffe this year. The purpose is to certify units for the NATO Response Force (NRF) by 2018 for the Joint Force Air Component command which is located in Kalkar. The exercise lasted from September 11 until 22, 2017 in Germany. The NATO Response Force (NRF) is a highly accurate and technologically advanced multinational army which consists of army forces, air force units, maritime units and special operations forces which all work together. The 10th Mountain Division is a light infantry division and is located in Fort Drum in the American state of New York. Originally, the division was the only specialized unit for fighting in mountains under arctic conditions. To honor this tradition, the soldiers of the division wear the text "Mountain" on their shoulders. Today the 10th Mountain Division consists of six large regiments and a command battalion. All these components have their specific tasks and together they form a small fully deployable army; all the American divisions are built up like this. Since the Russian intervention in the eastern part of The Ukraine, the European armed forces are in a major state of preparedness in eastern Europe. To support European troops, the United States is helping Europe during the Operation Atlantic Resolve to prove their NATO solidarity to Europe and it military force. Operation "Atlantic Resolve" is the support package of the United States for Europe and provides the continuous involvement in the collective security of this continent. In times of war, all NATO allies will help each other. After a deployment of more than nine months, the 10th Combat Aviation Brigade was withdrawn to the United States at the end of October 2017. This operation was performed under the name Host Nation Support. During this logistics operation, Eindhoven Air Base and the port of Rotterdam played an important role. The US Army has until 20 November to withdraw the 10th CAB from Europe. The unit will leave Europe by ship and will return to the United States. The 1st Air Cavalry Brigade takes its place and entered Europe at the same time. Since the Sale of the first series of F-16s in the Netherlands, the Project Disposal F-16 has been created. This project group had to prepare the F-16s that are being sold by the Royal Netherlands Air Force for delivery to the new owner. The two major customers for these second-hand fighter aircraft were Chile and Jordan. The choice for the Dutch MLU F-16s by these coutries was a very good choice, because the Dutch Air Force had maintained the aircraft perfectly over the years. Eventually already 57 aircraft are sold to those countries. In recent years, Jordan has been a major buyer of second-hand F-16s in the Netherlands and Belgium. This year the country will again purchase fifteen F-16s that have been on sale in the Netherlands since 2011. The F-16s left Volkel Air Base at the end of the year to Jordan under the name Operation Peace Falcon VI. One of the largest buyers of used F-16s in the world is Jordan. In 1994 the country came into contact with the western world more and more after it had made peace with the neighboring Israel; F-16s were bought in 1996. Flying in the total darkness has been a challenge for the fighter pilot for many years. This is also no exception in the Royal Netherlands Air Force. To train these skills, a number of weeks per year pilots are intensively trained in flying under these conditions. The Dutch F-16s are nowadays well equipped to fly in the darkness. In the weeks 44, 45, 46, 48 and 50, Leeuwarden Air Base and Volkel Air Base will fly from Monday to Thursday until 11 pm. The early darkness at this time of the year makes it possible to train intensively with night flights. Early in the year there were two F-16s from Volkel which had to divert to Eindhoven due to bad weather. In October, a Swedish Hercules and a Ukrainian An-12 arrived in one day. At the end of November, there were an TBM700 and a Casa CN-235 on the platform which left in the dark during the evening. This also resulted in some very nice shots from the parking garage next to the platform. Finally, the year at Eindhoven ended with a number of winter shots when an American KC-135 and a Dutch Hercules appeared in front of the lens. After a lot of snow which had fallen in the Netherlands on December 11, this was an ideal weather situation for the soldiers of the Dutch Airmobile Brigade to train under these harsh circumstances. In cooperation with the helicopter units of the DHC of Gilze-Rijen Air Base, an exercise was held on the Oirschotse Heide. The 11 Airmobile Brigade (11 LMB) consists nowadays of more than 4500 military personnel and has been educated and trained to be deployed by air using transport helicopters. The commander is a brigade general.